The trademark cancellation doesn’t mean that the team has to change its name. It just means that — pending inevitable appeals — the team could lose its exclusive use of the controversial word on football-related items. The trademark will remain in effect while the team goes through the appeals process, which could take several years. Given how much the team could lose on licensing deals and merchandise, it might behoove the organization to consider a name change to a name that isn’t offensive to an entire section of the population. It’s against the law to register trademarks that “may disparage” individuals or groups or “bring them into contempt or disrepute.” A group of five Native Americans challenged the registration eight years ago, marking the second time this has been done. This is also the second time the Trademark office has canceled the registration. Fifteen years ago, the USPTO agreed with petitioners that the trademark was offensive, but a federal court ultimately ruled that the plaintiffs lacked standing to file their complaint. 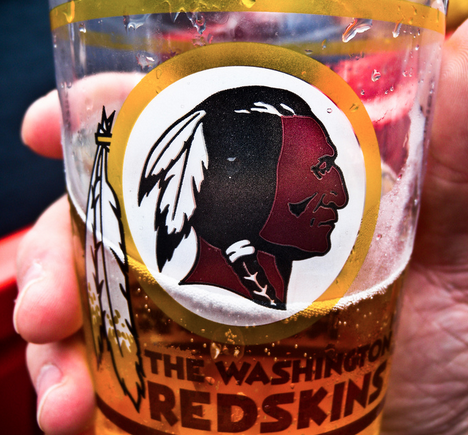 The team has been under increased pressure to change the name, which many Native Americans but owner Dan Snyder maintains that it honors the very people who are calling for the name to be changed.